Cut-Heal® has been a trusted name in animal health care for over 45 years! Multi+Care Wound Care seals, cleans, and aids in the natural healing for cuts, burns, and abrasions. The unique formula of balsam of fir, linseed oil, and fish oil helps prevent scarring, and provides a protective barrier so no bandaging is required. Keeps flies out of the wound. Discourages licking and biting of the irritated area. In many cases, hair regrows in the original color. Apply directly 1 or 2 times daily. 1. If the cut or skin irritation is small, apply to the wound once a day, making sure to apply freely to the cut, plus around the edges. 2. It is suggested that you do not wrap the wound. 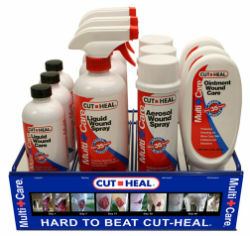 It is recommended to use only Cut-Heal®Multi+Care while the cut is healing. Note: To avoid residue build-up, do not over apply product. To remove residue build-up, apply rubbing alcohol and follow up with mild soap.